The IL-28 is a bomber and also a reconnaissance plane. 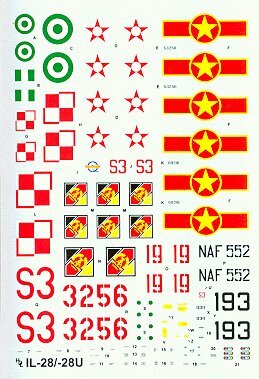 This sheet offers the modeller 5 decal options. 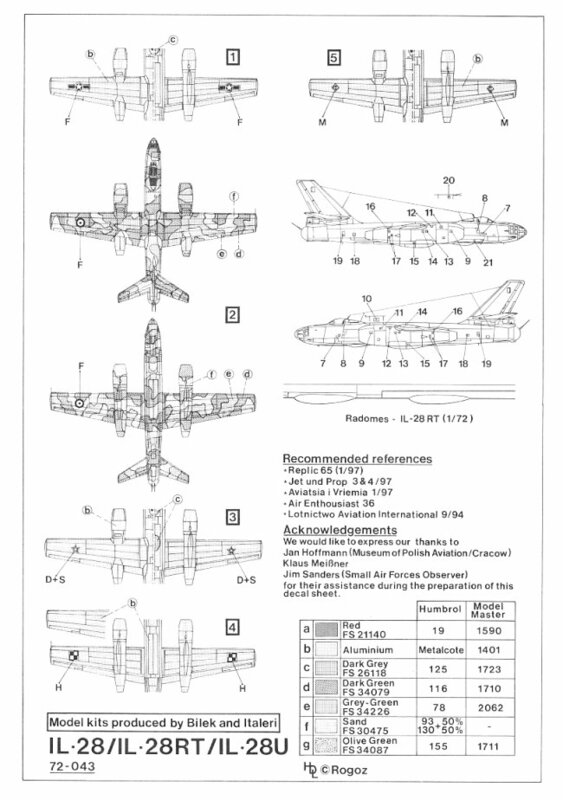 There are enough stencils included to do one of the 3 planes featured on this sheet, although with additional stencils all five planes could be made.  The first decal option is for an IL-28 Beagle of the North Vietnamese Airforce out of Phuc Yen AB, during the Laos offensive in 1971. This is a baremetal plane. 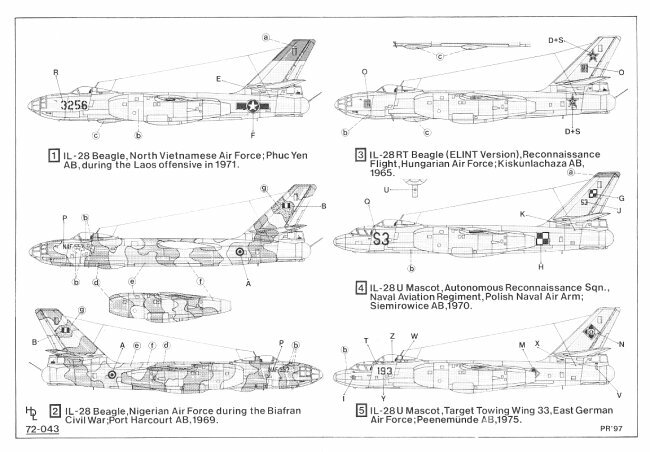 The second decal options is for an IL-28 Beagle of the Nigerian Air Force during the Biafran Civil War out of Port Harcourt AB in 1969. This plane is painted 4 different colours....Dark Green FS34079, Grey-Green FS34226, Sand FS30475 and Olive green FS34087. The third decal option is for an IL-28 RT Beagle (Elint Version) Reconnaissance Flight of the Hungarian Air Force out of Kiskunlachaza AB in 1965. This is a baremetal plane. The fourth decal option is for an IL-28 U Mascot of the Autonomous Reconnaissance Sqn. of the Naval Aviation Regiment of the Polish Naval Air Arm out of Siemirowice AB in 1970. This is a baremetal plane. The fifth decal option is for an IL-28 U Mascot of the Target Towing Wing33 of the East German Air Force out of Peenemunde AB in 1975. This is a baremetal plane.